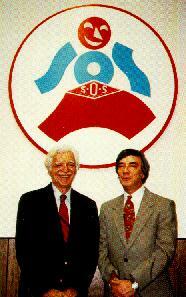 Did you know SOS is One of the World's Largest Manufacturers of Products for the Plumbing and Heating Industries? With over 150 different products to choose! Each product is sold with an unconditional Money Back Guarantee! We also offer a free Merchandising Rack with only 20 different products! Call your SOS Representative today! Sensational SOS Greenless Paste Flux: Is a self-cleaning, non-corrosive flux for soldering. It will not spit, spatter, or turn copper pipes green! Takes high torch temperatures, and is good with "lead-free" solders, as well as 95/5! No GREEN on your pipes and hands! GREENLESS! SOS Pro Flux: Excellent tinning flux! LEAD-FREE. Tins and fluxes in one operation. Completely Greenless formula. Can easily save one-third to one-half a roll of spool solder! Excellent for tough jobs; makes soldering "leak-proof", ideal for large diameter copper! Available in "lead-free" or 95/5. SOS is proud to announce this World Wide Web Home Page. We are the first chemical supplier in our Industry to have one. Our World Wide Web Virtual Chemistry Library links you to every major source in chemistry all over the world, right through our HOME PAGE! The Wholesaler, Plumbing and Mechanical Magazine, and The Supply House Times. Copyright ©1995, SOS PRODUCTS CO., All rights reserved.